Departure from Marrakech, in the morning, address Dades gorges. On the way we will cross the High Atlas Mountains, crossing the port of Tizi n’Tichka, making our way through numerous villages of Berber nomads that inhabit the area. Continue through Ouarzazate crossing the valley of Rosas, to enter the gorges of Dades, where the so-called « route of the thousand kasbahs » begins. Accommodation in Dades Valley and dinner at the hotel. Breakfast at the hotel. We go to the Gorges of Todra, where you can enjoy a pleasant walk between its imposing canyon with more than 200 meters of altitude, until the exit to the desert through the palm grove of Tafilalet. 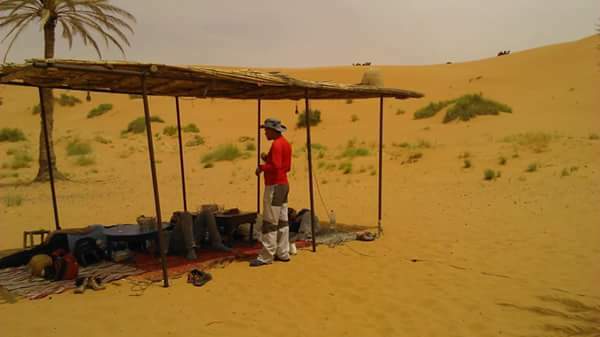 Arrival at the hotel at the foot of the dunes, where you can walk through the fine sand of Erg Chebbi, relax and enjoy this breathtaking landscape. In the evening, you will taste a delicious Moroccan dish. Accommodation in tends berber. After seeing the beautiful sunrise on top of the dunes, back in dromedary to the hostel. 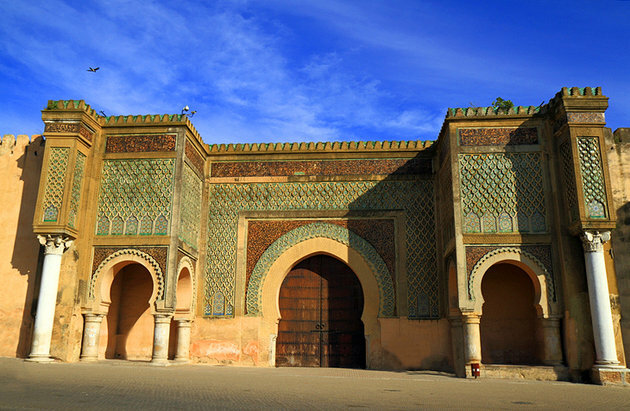 After breakfast, departure to the vast palm grove of Tafilalet passing through the city of Rissani (the alaouite dynasty and the capital of the former Sultan Alaouite). then we take the road to Fez passing through the beautiful valley of Ziz, Midelt Errachidia night at dinner and overnight hotel. Breakfast and continue the road towards Fez , stop in the cedar forest. 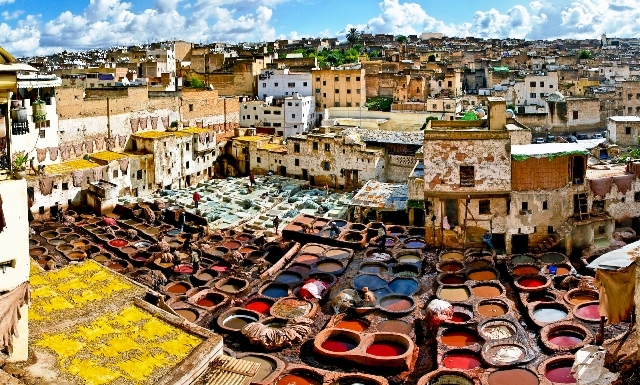 We will continue our journey through the Middle Atlas to reach Fez afternoon, intellectual and historical capital of Morocco, divided into three parts: Fez el Bali (old town), the new part built during the French protectado and the Jewish Quarter. 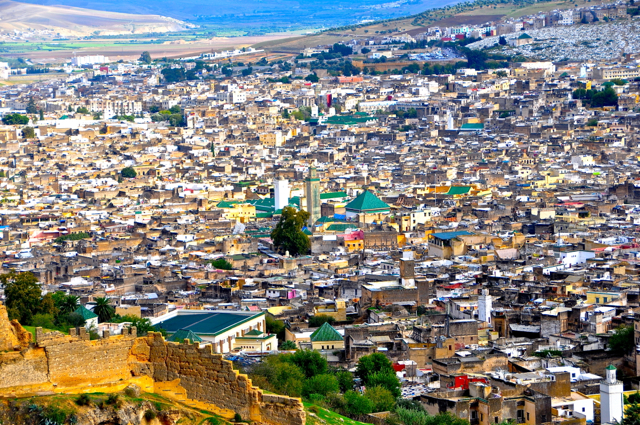 Fez has a pretty medina with its doors and its impressive walls, palaces … etc. End of our service. We will pick you up at your hotel or riad and we will leave Fez traveling to Ifran, a beautiful village known as « the Switzerland of Morocco » we will make a photo stop to the Stone Lion: it is located a few meters from the previous streets. He was carved by a German soldier during World War II in honor of the last lion of the Atlas. We will continue the way to Midelt. During this trip you will experience glimpses of the Middle Atlas mountains. Stopping at Azrou, we can admire the Gran Cedro Gouraud, the largest cedar mill in the region and also feed the hundreds of Gibraltar monkeys that inhabit the area. After a time in the forest, the journey continues to Midelt along the magnificent hills and mountains of the Middle Atlas, after the town of Midelt you will travel through the fascinating Tizi Ntalghamt, the Valley of Ziz, the provence of Errachidia, here you can have lunch and enjoy the hospitality Berber. You will then travel along the lush Ziz Valley, stopping for panoramic views on the way to Erfoud and Rissani. Arrival in Merzouga in the afternoon. You will be welcomed with a glass of mint tea before camel ride, guided by an experienced camel man to explore inside the golden sand sea of Merzouga. Dinner under the nomadic Haima. 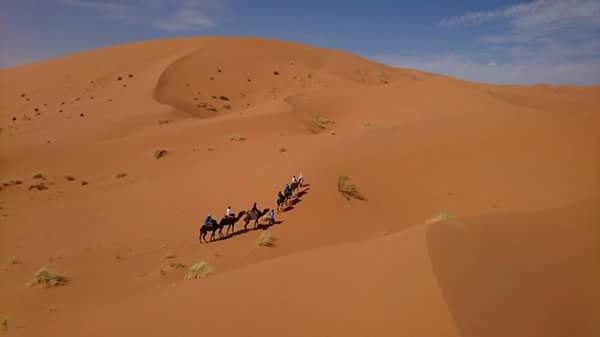 It is advisable to get up early to walk to the highest dune around the camp to enjoy the magnificent sunrise, then return in dromedaries to the village of Merzouga. After a rich breakfast and shower, we have to say goodbye to the desert and we will leave for Rissani where we will visit its market (if we are lucky if it is one of the Market days: Tuesday, Thursday or Sunday) we will follow the road to Erfoud where there is also possibility Visit the fossilized marble factory before continuing to the palm groves of Touroug and Tinjdad. One more hour we will arrive at one of the strongest points: The Gorges of Todra. The river Todra has formed a gorge of vertical walls of enormous proportions and of great beauty, it is the paradise of the climbers and a unique place. Lunch on site. Lunch on site and a half-hour walk would be advisable to see and enjoy the Gorges in detail. In the afternoon we continue to the Dades Valley offering a variety of landscapes much greater than the Todra valley, Dinner and night in Hotel. After breakfast you can enjoy one of the best views of the Dades valley from a strategic lookout point in the mountains, from there you can appreciate the large number of kasbahs and the scenic features of each. Then we continue by a route point with different kasbahs of tourist interest. 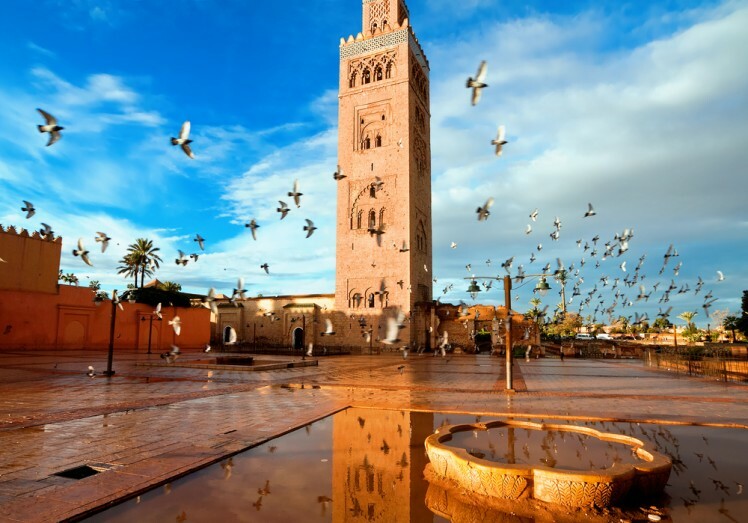 After a few stops to enjoy the « Mil kasbahs », the Rose Valley and the great palm grove of Skoura, we will arrive to Ouarzazate to visit the Kasbah of Taourirt, former residence of the Glaoui Pasha. And if you are interested we can visit the film studios and cinema museum. Continue on the route to the fortified village of Ait Ben Haddou where we will visit the famous Kasbah (World Heritage declared by UNESCO in 1986). Several famous Films including Gladiator, Obelix, The Mummy, The Jewel of the Nile, Sahara with Penelope Cruz … etc. Free time for lunch in the village. In the afternoon we start our way to Marrakech passing by the mountain port of Tizi Ntichka with some stops to take pictures. 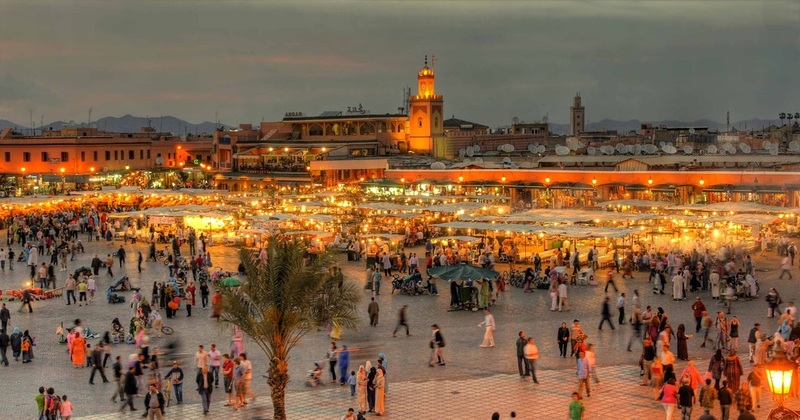 Arrival in Marrakech about 18h or later, transfer to the hotel and end of our services.